Tomorrow afternoon we set up for the Birmingham Fine Art Fair at Shain Park in downtown Birmingham, Michigan. I really enjoy doing this show. The art is well-juried and it isn't so big that people get lost walking around. This year I will be premiering my newest paintings, The Wine Series. 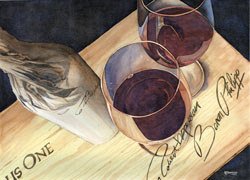 This series was painted in February of 2008, and begins with four paintings of fine wine in settings with high contrast lights and darks. It took about two weeks to complete the four paintings, which I worked on simultaneously. There are lots of delicate glazes of varying colors which create the mood in the pieces. At the show I will have a series of photos I took which show the progress of one of the paintings. You can also see the images on my website under the still life section. If you are in Birmingham this Saturday or Sunday, please stop by and say hello. My booth number is D130 and I will be on Bates Street. To see the progress photos of one of the wine paintings you can click here.